The Long-Billed Curlew was a mystery to scientists. Where exactly did it travel? Breed? Rest? How many of the large North American shorebirds still existed? And how could conserva­tionists help protect the species from extinction? Once so common in the southeast U.S. that John James Audubon’s famous painting of the Long-Billed Curlew features Charleston in the background, hunting and breeding habitat loss has devastated the eastern popula­tion of curlews. This year, researchers from the Smithsonian Conservation Biology Institute’s Migratory Bird Center tracked a male Long-Billed Curlew, which came from a near-ex­tirpated wintering population of less than 100 curlews along the Atlantic Coast, to its summer breeding habitat in Saskatchewan, Canada — the first time that anyone has tracked a curlew from this vanishing group. Thanks to this lone bird, scientists are finally getting answers about this species’ unknown migration. 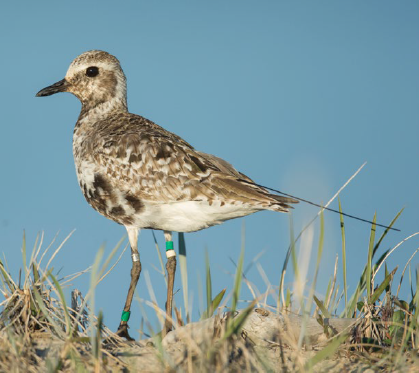 The antenna of a miniature solar-powered satellite transmitter is visible on this female Black-Bellied Plover. She was tagged on the North Slope of Alaska in June and is now spending the winter in Peru, while her mate is overwintering along the Gulf Coast of Mexico. The aluminum band, on her upper right leg, and the uniquely positioned plastic color bands help to identify her from afar. Tracking the Long-Billed Curlew is just one of the many migratory bird track­ing and habitat conservation programs we support through our Charitable Investments Signature Program focused on water and biodiversity stewardship and conservation efforts. In North America, more than a third of bird species are at risk of extinc­tion, according to a 2016 study by the North American Bird Conservation Initiative. The first of its kind to look at the vulnerability of bird popula­tions in Canada, the United States and Mexico, the study found that 37 percent of the 1,154 species on the continent need urgent conservation action. Understanding and tracking bird migration is crucial for conserving habitats that are essential to species survival. 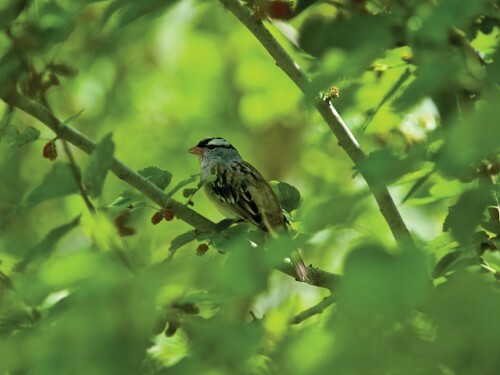 Migrating birds are what is known as an “indicator species” — their issues foretell other problems within the ecosystem and provide an opportunity to mitigate potential risks. 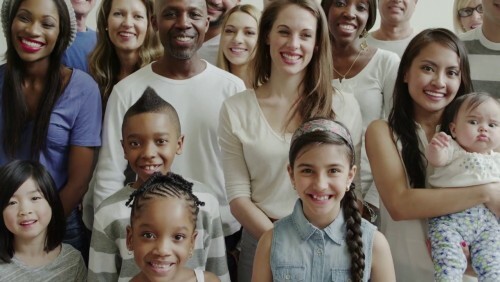 Taking a wide-angle approach by sup­porting educational and conversation efforts offers an opportunity to lever­age research and establish priorities for action. Conservation work such as these strategic migratory bird projects also helps us learn about ecosystems near our operations, develop local relationships, and provide volunteer opportunities to spend time in nature. Additionally, by supporting research we can reduce the chance that regulatory or policy decisions based on missing or inconclusive scientific data negatively impacts our operations. Working with the National Fish and Wildlife Foundation (NFWF), we fund the ConocoPhillips SPIRIT of Conservation and Innovation Program to support projects focused on the restoration of ecosystems and habitats, particularly those focused on high-pri­ority North American migratory species. We also support innovative conservation technologies and tech­niques in areas where we operate. We partner with Ducks Unlimited to help manage and conserve U.S. Gulf Coast wetlands — important wintering habitats for waterfowl. By identifying effective coastal restoration and mit­igation projects and working closely with diverse stakeholders, we support a variety of efforts, including freshwa­ter-introduction and marsh-terracing projects, shoreline stabilization, coastal ridge restoration, and hydrologic improvements. 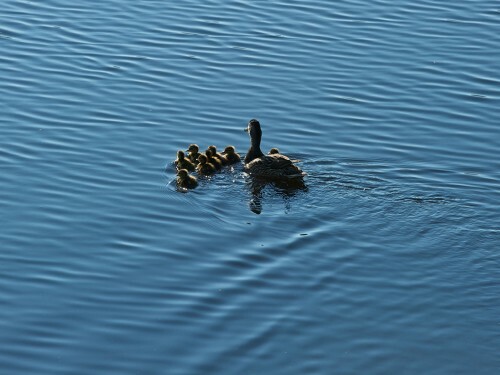 “ConocoPhillips is an excellent partner because their stewardship principles are similar to ours, and they have a very good reputation for working with agencies and moving projects forward,” said Jerry Holden, director of conserva­tion programs for Ducks Unlimited. In northeast China, we worked with the International Crane Foundation to manage and restore wetlands in Momoge National Nature Reserve, the largest global staging area for Siberian Cranes. About 3,600 are present daily, approximately 95 percent of the world population, for almost two months of each migration season. Significant water shortages threaten the habitats of Siberian Cranes and other species. Until now, no one has studied these habitats systematically or developed conservation recommendations and the species appears to be under threat. 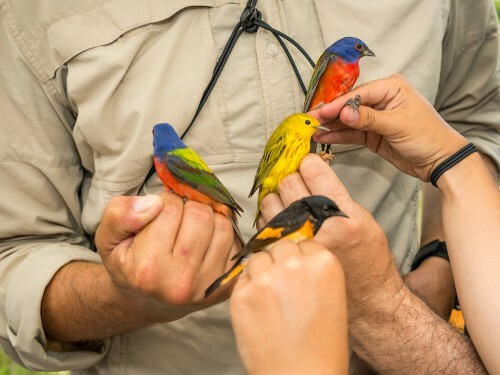 We help advance the conservation and understanding of migratory birds through work with the Smithsonian Conservation Biology Institute’s Migratory Bird Center. Through this partnership, we gain a better under­standing of the important habitats throughout their migration cycle, and how we can take a coordinated approach for more effective conserva­tion. The center conducts both long-term and applied research. 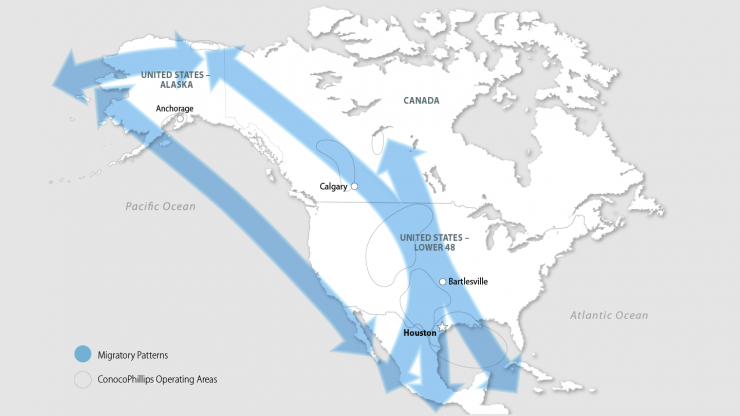 Using advanced tracking technologies, we are involved with six projects chart­ing the journeys of 12 migra­tory bird species, several of which spend parts of their migration cycle near our areas of operation in Alaska, Alberta, Saskatchewan, Colorado, and Texas. 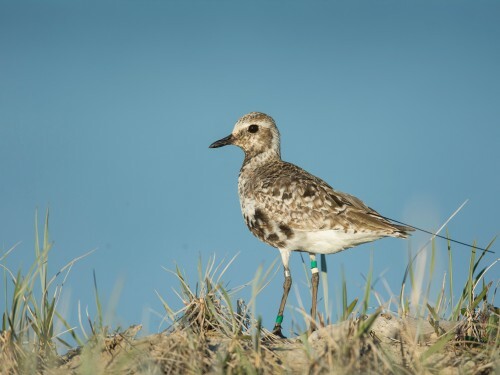 In 2016, a range of innovative track­ing devices were used to fit a variety of birds with track­ing tags. Species included Pacific Loons, Black-Bellied Plovers, Canada Warblers, Connecticut Warblers, Rusty Blackbirds, Common Nighthawks, Olive-Sided Flycatchers, Mountain Plovers, Glaucous Gulls, and Long-Billed Curlews. In Alaska, ConocoPhillips employees helped tag Pacific Loons and Black- Bellied Plovers near our Alpine facility on the north slope. A hoop net was used to catch the birds, which were then fitted with a sat­ellite tag that transmits daily data about connectivity information including migra­tory pathways, stop loca­tions and wintering areas, and the different patterns of individual birds of the same species. We discovered a distinct migratory divide between North Slope and Western Alaska Pacific Loon populations. The former crosses over to Russia, China and South Korea, while the latter flies directly south to Mexico. Helped deploy GPS tags on nine Glaucous Gulls at Alaska’s North Slope. 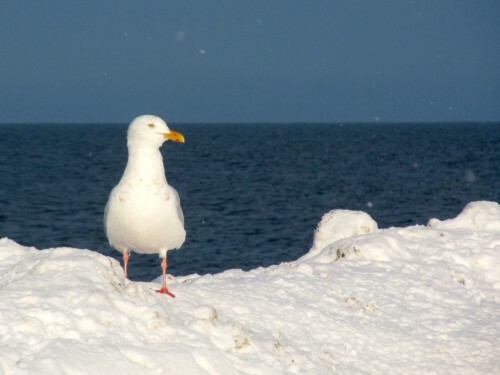 This study was the first to focus its attention on immature arctic seabirds, who were originally thought to spend their first year along the U.S. west coast. Data revealed however, that these birds actually migrate to Russia. 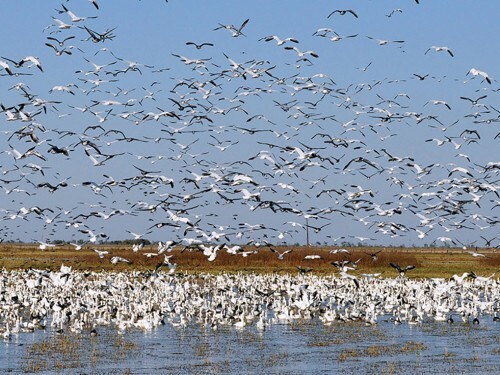 Established the ConocoPhillips Bullshead Conservation Area, with more than 2,050 acres of native grasslands and high-value wildlife and plant species, including large numbers of waterfowl. Protecting this land means protecting important habitat features that many of these species need to survive. Collared and Lark Bunting in partnership with the Rocky Mountain Bird Observatory. 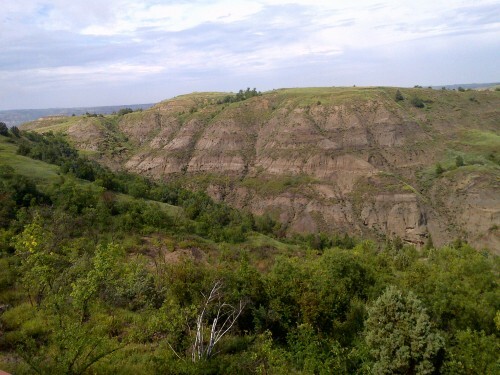 The project will inform conservation efforts and management actions in the Northern Great Plains and full annual cycle demographic monitoring across the full migratory range. Tagged 43 migratory birds, working with students and faculty from the University of Alberta Edmonton. Wildfires near Fort McMurray, in the summer of 2016 significantly altered the habitats of birds that had been tagged in previous years. 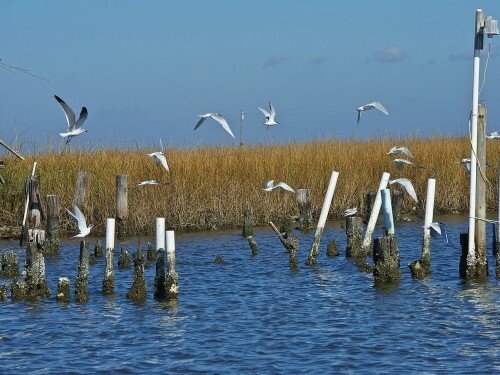 Increased the number of oyster reefs and migratory bird islands in Galveston Bay to provide critical habitat for oysters, Whooping Cranes, Gulf Coast Ocelots and thousands of migratory birds through collaboration with Houston Wilderness. The project is a key step to protecting and preserving the unique biodiversity of the Greater Houston Region. 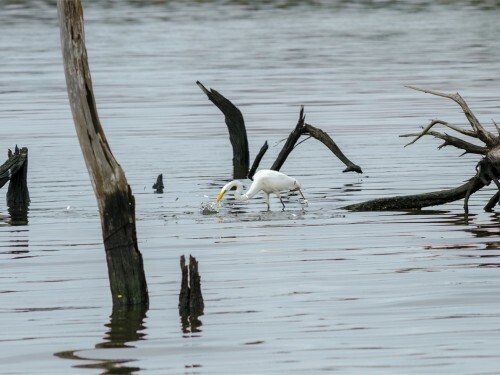 Restored more than 2,500 coastal acres of waterfowl wintering areas through the Liner Canal, Carencro Bayou and Lost Lake projects, working with the Louisiana Coastal Protection and Restoration Authority and the North American Wetlands Conservation Council. Preserving this marshland is crucial as it is an important area for migrating waterfowl. Enhanced or restored over 600 acres of habitat for the Lesser Prairie Chicken in Colorado, Kansas, New Mexico, Oklahoma and Texas in partnership with the Western Association of Fish and Wildlife Agencies. The project will contribute to stabilizing Lesser Prairie Chicken populations by creating additional habitat connectivity. Restored and enhanced over 1,700 acres of native prairie and wetland habitat on four Texas Parks and Wildlife Department Wildlife Management Areas on the Central Coast, working with the Texas Rice Industry Coalition for the Environment. The project will restore 600 acres of prairie and enhance and restore 1,162 acres of wetland in an area that is crucial to migratory birds. Helped tag more than 2,100 birds at the Mad Island Marsh Preserve, a rest-stop for the birds after flying across the Gulf of Mexico. This effort by our volunteers will allow scientists to track the migratory patterns of songbirds from the Smithsonian Bird Banding Center. 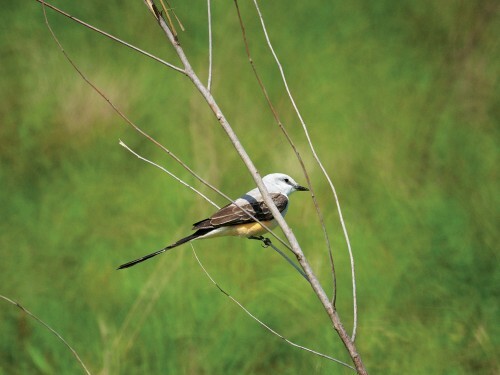 Enhanced or restored 13,570 acres of habitat for grassland bird species, such as Loggerhead Shrike, Eastern Meadowlark and Scissor-Tail Flycatcher in partnership with the Parks and Wildlife Foundation of Texas and the Texas Parks and Wildlife Department. Private land habitat restoration and enhancement will lead to increasing quality and quantity of grassland habitat.